For this Beachy Bachelor, Sarah Barnard introduced mid-century vintage character with a beautiful collection of modern pottery, driftwood and vintage ceramic vases. 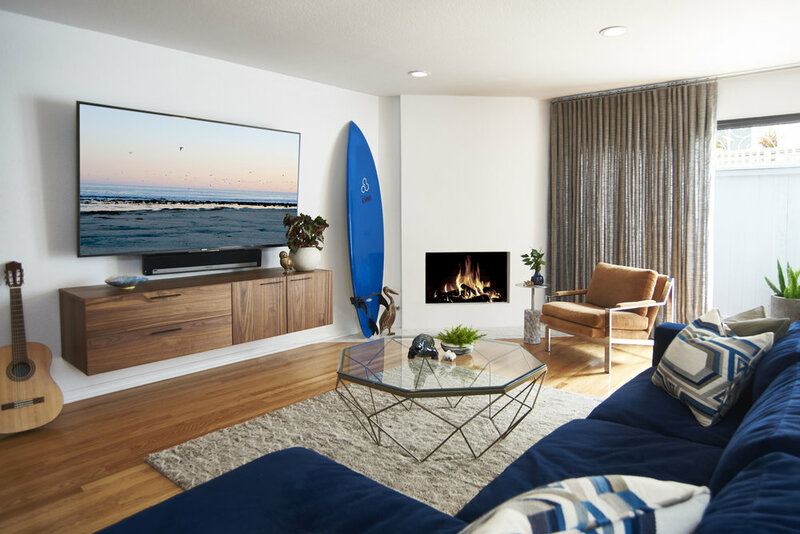 This Santa Monica townhouse embodies the coastal California luxury lifestyle, effortlessly combining opulent materials with a relaxed beach-side setting. The masculine dining room and adjacent patio make the most of their indoor-outdoor connection with a versatile area rug specifically selected to withstand the bright light and high traffic. A sculptured glass and steel chandelier reflects the natural light of the surrounding space. Handmade roman shades attach to a custom wood enclosure for privacy and shade on the patio. A natural teak root ball fashioned into a rugged side table pairs with a weathered teak armchair and lightweight concrete pottery. Acacia wood deck tiles add a warm angular base to the cool blue patio space. The vintage mid-century modern whale ashtray is brass and Sarah found it in Georgia. The master retreat features a handmade bed of tweed by Domonique Keiffer from Venice, Italy is covered in Belgian linens, and shaded by wool draperies. A bold, abstract painting by Jonathan Elder hangs above the bed. Surf-inspired artifacts and unique vintage pieces complete the look. A vintage leather chair with its original leather patina, designed by Percival Lafer, manufactured in Brazil in 1958. Sarah worked with her longtime collaborator, artist Reid Winfrey, placing several of his surf inspired paintings in the beachside home.